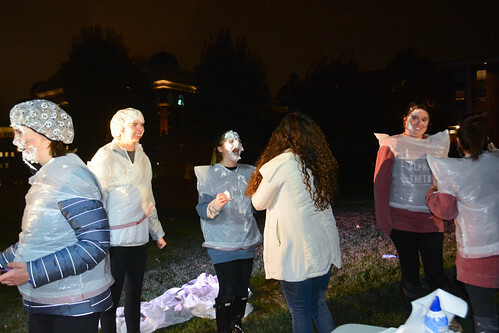 The crisp fall air and crunchy leaves made Friday the perfect night for a carnival, and Belmont’s Kappa Alpha Theta chapter took the opportunity to raise money for its philanthropy. The CASA Carnival raised more than $6,000 for Court Appointed Special Advocates, which provides court appointed advocates for abused and neglected children. The event featured live music performed by Belmont students and various carnival games, along with Theta’s annual Pay to Pie an Eta Phi. Other Belmont sororities and fraternities participated in the event, along with Student Government Association, Delight and the Belmont University Songwriters’ Association. President Dr. Robert Fisher even stopped by to support the event. As a social work major, Shaw shares a personal connection with CASA. “I believe that no child deserves to feel not valued, heard, loved or seen,” Shaw said. Sarah Harrison, president of Belmont’s Theta chapter, was excited to see the event finally come together after months of work, she said. “It’s a great fall event to celebrate our semester and the things happening at Belmont, as well as our philanthropy,” said Harrison.